Non-profit agency that provides assistance with emergency food, utility, and perscription needs as well as long term work goals and mentoring for needy residents of Parker Co. Offering adult ed classes, tutoring, job training and also operates resale store called The Hope Chest. crisis intervention for domestic violence, sexual assault and victims of crime. Grace House Ministries is a faith based 501c3 non-profit located in Weatherford, Texas. Founded in 1993, Grace House Ministries strives to promote hope, life, and knowledge in the community through The Options Clinic, Grace House Pregnancy Center, and Pure Truth in-school training program. Non profit volunteer group rescuing homeless/shelter dogs and cats in Parker County. disaster relief, community disaster education, health & safety training (CPR/AED First Aid), aquatics, emergency communition for military personnel and their family, youth programs. Sanctified Hope is a Christian based nonprofit transitional program for formerly incarcerated individuals offering housing, Christ-Centered training, education, and teaching life skill that lead to career opportunities and successful integration into society. 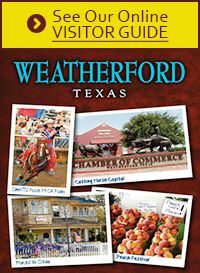 The Weatherford Public Library promotes free lifelong literacy, learning, and enjoyment of reading in Weatherford and Parker County.